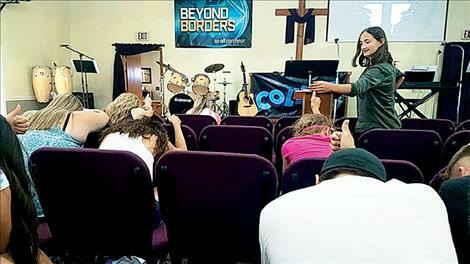 Youth group members worship and sing songs at the Cornerstone Faith Center. Heads Up 7 Up was played during the youth group meeting. ST. IGNATIUS – From building playgrounds to throwing back to school parties, Cornerstone Faith Center is constantly looking for opportunities to engage in the community. 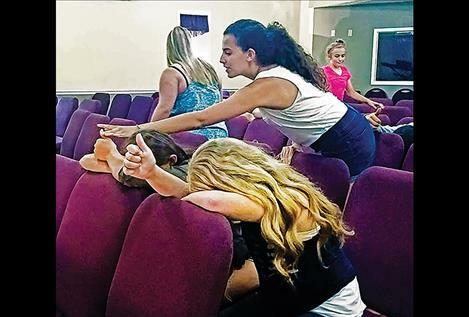 The center has grown since Lynn Lapka began his role as pastor 11 years ago. Since then, Cornerstone has successfully run a pizza shop, a race team, and a youth group. One of its more recent projects is Mission Summer Movies, an event where children and family movies are shown at the Mission amphitheater after dusk. The group got together last week and focused on their regular worship themes, played a few games of Heads Up 7 Up, and talked about the movie nights. Youth pastor JP Thomas says the idea for the movie project started with a question, “What can we do with an amphitheater?” The amphitheater has been lightly used for the occasional play and live music during Good Old Days events. Cornerstone saw its potential and that’s when the church leaders started looking at the cost of projectors and sound systems. The equipment and movies are funded completely by the church while concessions are run and donated by church volunteers. Collide is the name of the church youth group that runs concessions during movie night. Lane Smith, a member of Collide, is one of the volunteers. He said his favorite part of the night is seeing concession volunteers dress in jumpsuits and other outfits themed to the night’s film. He was dressed as a baseball player at the previous movie. “You never know what you’re gonna wear till you’re there,” he said. Pastor Lynn brings different uniforms for volunteers to wear and it’s a surprise every time. Smith isn’t the only youth group member who has volunteered. Justin Evelo and two of JP’s daughters have also found themselves dressed in fun outfits for concessions. This is Cornerstone’s fourth summer with the series. The Sandlot was the first movie of the series this summer. Around 250 people attended. Last year, the movies brought in around 150 people a night, and Cornerstone expects around 300 people to attend the Good Old Day’s movie night. It has yet to be determined whether this year’s Good Old Day’s parade will feature a float to match the film shown that night. JP said the atmosphere at the movies is energetic and positive. “It’s open to whoever wants to come,” he added. The next movie night is planned for Saturday, July 21, at dusk and will show the newest version of Jumanji. The Mission Summer Movie Series is a great way to spend a Saturday night with friends, family and free food. Cornerstone hopes for another great turnout before the 2018 August finale at Good Old Days. Jaden Coston is working with the Upward Bound Work Study program through the Salish Kootenai College to learn about jobs that involve college degrees. She is a senior at Charlo High School and is interested in writing and science. SKC received a grant to allow about a dozen students from across the Confederated Salish and Kootenai Reservation to participate. She worked with the Valley Journal for two weeks.